Here's another character poster for the big screen adaptation of the classic musical Les Misérables. 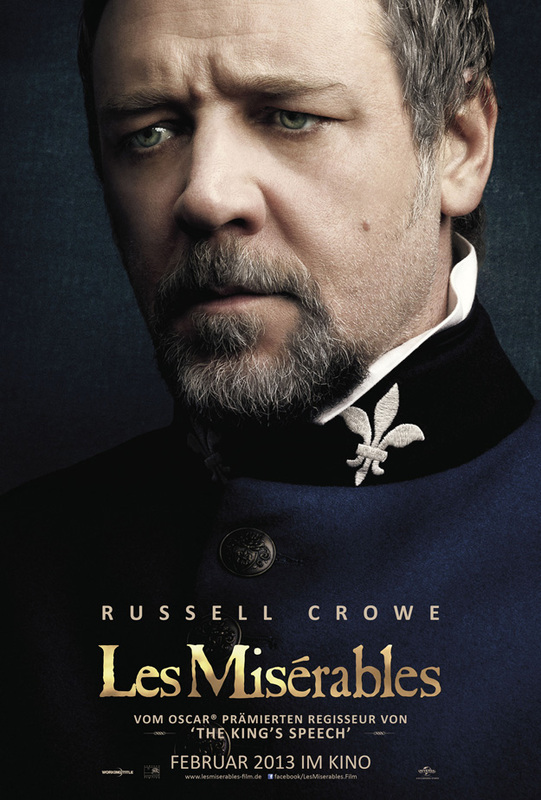 It features Russell Crowe as Inspector Javert. The Tom Hooper-directed movie also stars Hugh Jackman, Anne Hathaway, Amanda Seyfried, Eddie Redmayne, Aaron Tveit, Samantha Barks, Helena Bonham Carter, and Sacha Baron Cohen. We still have yet to hear what Crowe sounds like when he sings. I've heard almost everyone else in the movie sing a little, but Crowe's voice still remains a mystery. Out of everyone in the film, he's the one I'm not sure about when it comes to singing. I'm curious to hear how he sounds, but he definitely looks the part! Set against the backdrop of 19th-century France, Les Miserables tells an enthralling story of broken dreams and unrequited love, passion, sacrifice and redemption–a timeless testament to the survival of the human spirit. Jackman plays ex-prisoner Jean Valjean, hunted for decades by the ruthless policeman Javert (Crowe) after he breaks parole. When Valjean agrees to care for factory worker Fantine’s (Hathaway) young daughter, Cosette, their lives change forever. The movie is scheduled to be released on December 25th. Do you think Crowe will be able to awesomely pull of the musical numbers in the film?